For some reason bread and butter usually has a savory connotation, but we gotta say that turning it into a sweet treat is sheer genius! And if you’ve ever been to Texas Roadhouse then you know they’re on to something with their fluffy, candy-like spread. After a bit of experimentation we’re happy to say that we’ve perfected our copycat version of their famous cinnamon honey butter. The best part is it’s super easy to make and the ingredients are so simple, we bet you’ve already got what you need at home to whip up a batch right now – so what are you waiting for?! This delectable butter spread goes great with homemade bread! This bread is one of our favorites, and has a surprise – it can be made in a slow cooker! 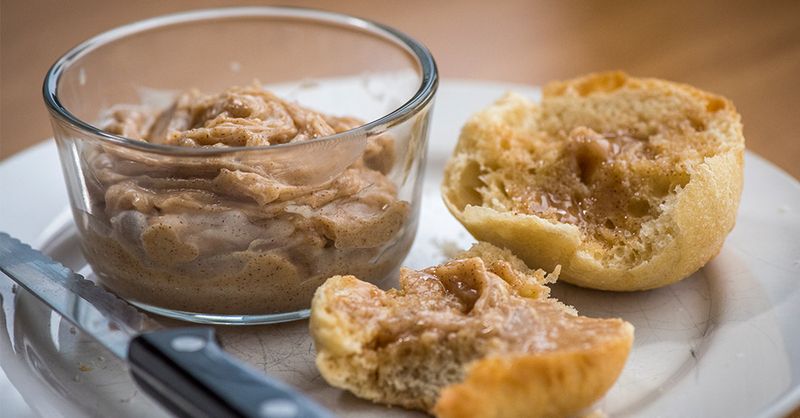 Click here to find the recipe for the perfect companion to the Copycat Texas Roadhouse Butter! In a small bowl, whisk together honey and cinnamon until combined. Place softened butter in a large bowl or mixer and gradually add in powdered sugar. Beat until combined, then add cinnamon honey mixture and mix until fully incorporated. Taste and add more honey or cinnamon, if needed. Serve immediately or refrigerate in an air-tight container and serve at room temperature.